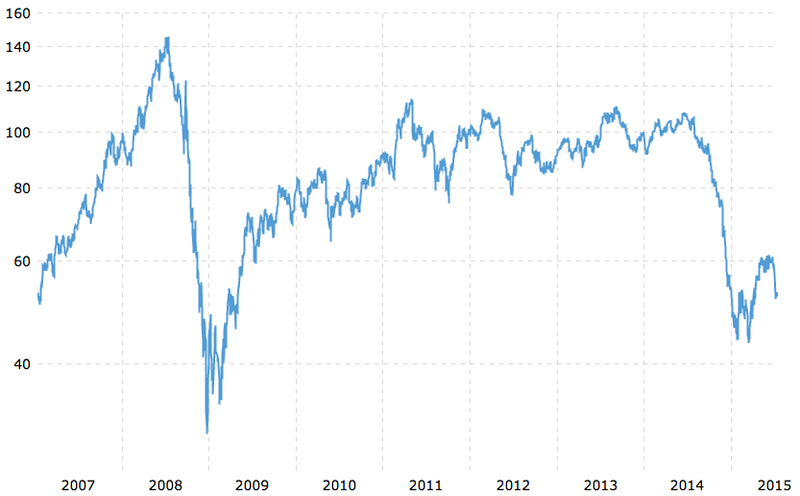 In 2015 oil was one of the main topics – no one had predicted it would fall from $100 to $50 and when looking at historic chart and seeing that even in 2009 oil prices got back up quite fast, I thought – this would be a nice gamble. I could have bought instruments like $OIL or $USO to get exposure to oil prices, but instead selected a very high risk instrument: $UWTI – VelocityShares 3x Long Crude Oil ETN. If oil price went up by 5% per day, then $UWTI would go up by 15%, and the opposite – if oil price went down by 5%, $UWTI would loose 15% of value that day. $UWTI is used mainly for day trading and it is not recommended to hold it for weeks or months because of time decay, but as I was expecting oil price to recover fast, I thought – it would not be that bad, and can hold it for couple of months, if needed – because potential gains would outweigh the decay. Bought $4500 worth of $UWTI in July 2015, but as oil kept going just lower and lower, and my losses increased, after 5 months and more than 80% down, I decided to save the remaining capital and close position in Dec 2015. 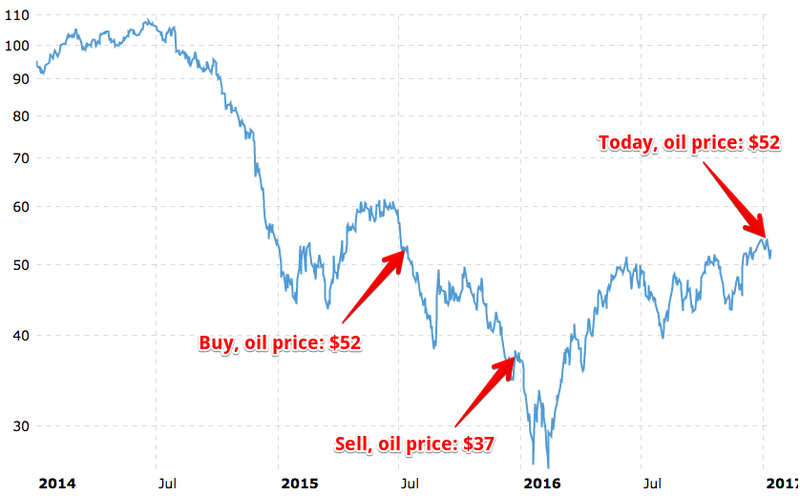 As you can see in the chart, in Dec 2016 oil price is back at $52. So maybe I just should not have closed the $UWTI position and waited for another year? Not really. I was hoping for 20% or so lost per year because of time decay, but as I learned the hard way – it can get much worse. After I closed my $UWTI position, it went down some more and then in June 2016 reached my closing price, but after that – again mostly went down, and starting from July 2015 till Dec 2016 when oil price reached $52 again, $UWTI had lost -89%, so by holding longer – I would loose another 50% of remaining value. Time decay is real. Don’t go long on any highly leveraged ETF/ETN unless position is open for super short time like one day or few days at most, otherwise – risk repeating my scenario. Putting big % of portfolio in a high-risk trade is not a good idea unless you want to blow up your account really fast. I have high risk tolerance, but losing is not that fun. And doing trades where you lose by default (because of time decay) is not that smart either. Direxion Daily Junior Gold Miners Bear 3X Shares provides daily -3x exposure to an index of junior gold and silver mining companies from developed as well as emerging markets. $JDST can be more volatile than $UWTI. Rough example: if gold price goes down by 1%, then junior gold mining companies ($GDXJ) will go down about 3%, and $JDST will go up by about 9%. So if there is a 3% daily change in gold price, $JDST can easily move by 25-30% the same day. After Trump got elected, stock market went up, USD got stronger and gold price went down. I was expecting that gold price will recover, but as I don’t plan to go long any leveraged ETF anymore, I did the opposite – shorted $JDST after it went up from $20 to $40. I started with $1000 short position on Nov 23rd, 2016. Then on Dec 14th gold price went down 1.3% and $JDST shot up about 20% – I added another $1000 short position. But next days move was even bigger and $JDST was already above $50, so I added another $1000 to my short position. This was my final increase, because I did not want to blow up my account if $JDST increased further a lot. Plan was to wait as long as it takes, because in this trade time decay worked in my favor. 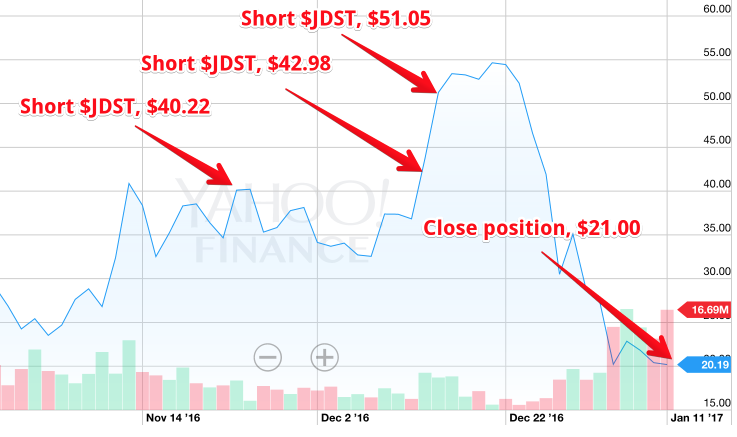 In total I was shorting 68 shares of $JDST with average price of $44.34. 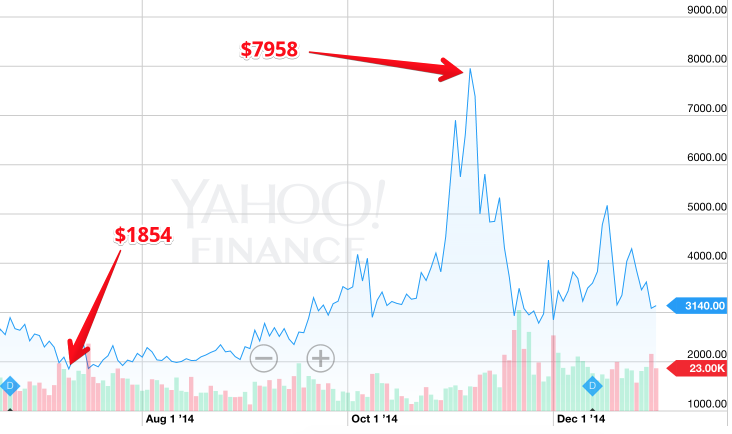 On Dec 21st I was down -25% or -$750, but considering the volatility – not that bad. 2 weeks later – when I saw my position was up more than 50%, I closed it. And now lets look at the gold price chart and see how it compares to $JDST chart. My first short was opened when gold price was $1189, then others at $1143 and $1128. When I closed my position, gold price was almost the same when I started. While it might seem that shorting leveraged ETFs is a very easy way how to make money, there are also big risks involved that you need to be aware of. These ETFs can get extremely volatile. 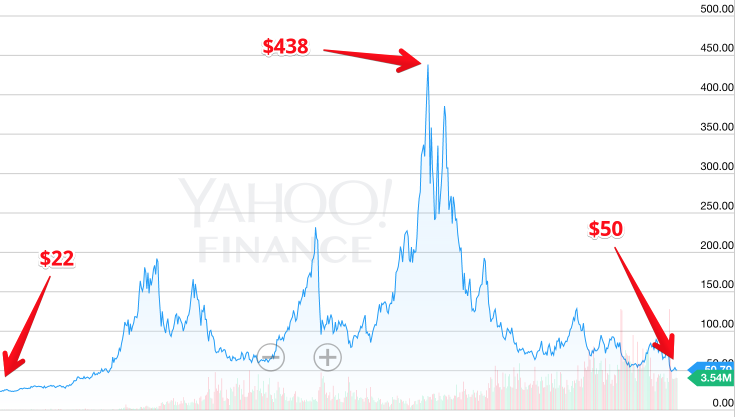 Imagine if you would have shorted $3000 worth of $JDST and its value goes up by 430%, as it did in 2014. Then suddenly your short position is losing $12 900, and if you don’t have the stomach for that, you might close position to not lose more, or if you don’t have enough cash in your account to cover these losses, then you might get automatic margin call from your broker and your position can be closed automatically at the worst moment possible. How about oil? Imagine if you would have shorted $DWTI in July 2014, when it was $22. Would you have enough capital and will power to not close position, when it goes 2000% against you? So from $3k short you would have $60k in unrealized losses in best case scenario. And if you would survive that, then 2 years later your position would still be losing money. If you consider such a trade, think hard about risk management. Also check what will be the borrowing costs – you might need to pay up to 10% per year for borrowing shares to short, and from some brokers or in some situations it might not even be possible to get shares of 3x leveraged ETFs for shorting. Previous Previous post: How to avoid high fees when investing in stocks?